Super Bowl ticket sellers have seen an increase in buyers now that meterologists are forecasting a milder Sunday than once predicted. The forecast for East Rutherford, N.J. for Super Bowl Sunday calls for a high of 38 degrees and no precipitation, according to the National Weather Service. For fans who were hoping for a battle in the worst elements, it seems as if you’re out of luck. The New York area has been experiencing one of the coldest weather stretches its had in some time, with Wednesday’s high being only 23 degrees. If the forecast is accurate, the two teams won’t have to play out of their own home playing elements for this time of year. After the cold weather forced the average ticket price to drop as low as $2,002, the average has since raised to $2,282, according to SeatGeek.The average flip for a resale ticket is $3,022, according to ticket market aggregator TiqI. 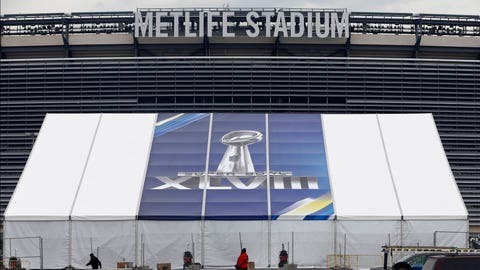 "It seems clear that ticket buyers were waiting on the sideline until a reliable weather forecast was released for Super Bowl Sunday," Will Flaherty, a spokesman for SeatGeek, told Bloomberg News. "Now that it looks like Sunday night’s weather will be great for football, folks have taken advantage of the dramatic 40 percent price drop we saw over the weekend and snapped up many of the great deals out there." In the past 48 hours, there have been about 30 percent more Super Bowl tickets sold than the two days following the AFC and NFC championship games, which is unusual. According to SeatGeek, there are 16,500 unique seats for sale on secondary-market sites. "For past Super Bowls, the 48 hours post-conference championships are almost always the most active period in terms of ticket sales volumes," Flaherty said. About 21 percent of tickets sold online in the past 48 hours went to New York buyers, followed by folks from Washington purchasing 17 percent, 10 percent to New Jersey, and 8 percent each to Colorado and California. "It still seems increasingly likely that Sunday’s crowd will skew pro-Seahawks," Flaherty said.